It has been almost six weeks since my last race. The NYC Marathon was waaaaaaayyyyyy back on November 1st. Seems like a lifetime ago. Seems like all I’ve done since is work my tail off, had very few days off, and get sick for two weeks. It really has been a bummer! I am sufficiently rested, and feel like signing up for a marathon for the first part of the year. Problem is…. I just can’t find anything that works out for my schedule. I’d love to run Charleston in January, but that would entail an overnight stay in SC, and taking my dogs along with me. I’m just not sure I want to do that. I really, really want to run Hilton Head for the third year in a row, but damn them for changing a race date of the first weekend in February to the following weekend, which is Valentines Day weekend! I can’t travel during Valentines. Well, not if I want to keep my job. So, that ones out. Again, Boo to Bearfoot Sports for changing the date! A return to where my marathon days began, in Myrtle Beach, would be a perfect way to start out my racing for 2016. Another problem, it’s just too close to my race weekend in Asheville. I can’t take nearly every weekend from mid March to mid April off, now can I? So, where does all of this leave me? I guess nowhere. I cannot spend money on a destination race involving any airfare so soon, so any marathon I begin my new season with has to be within decent driving distance of central NC, between mid January, and the end of February, and not 1/33-1/30 (on vacation), and not Valentines weekend. I’ve scoured the race calendars, and it just doesn’t seem like it’s going to work out. Unless of course, you know of one that would fit perfectly into my parameters. Feel free to share, if you do. :). If not, I guess I will just have to spend the cold, dark winter months in training with no real marathon plans on the near horizon. Ugh, I hate not having a rock solid race plan and something to look forward to after the first of the year. Help! The are a ton of “local” races in the triangle region where I live. I mean a ton! 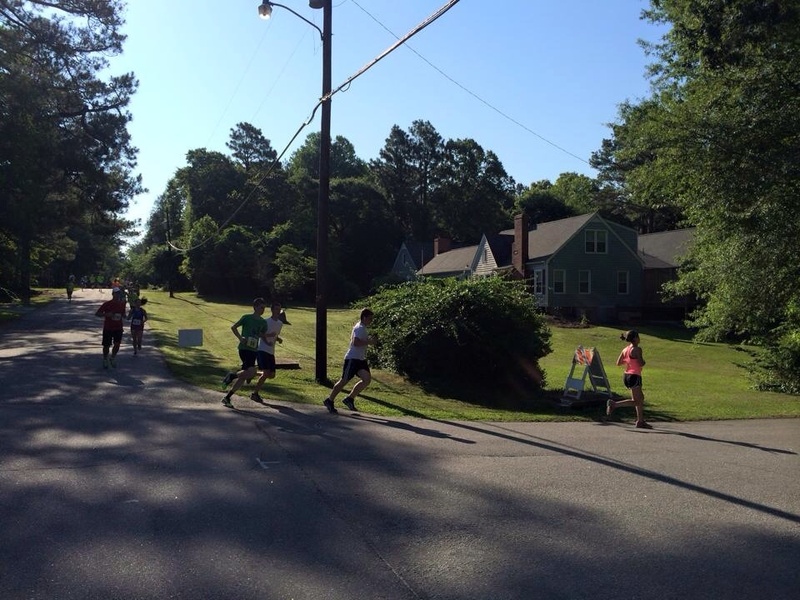 Huge, fun races like the City of Oaks Marathon, Tobacco Road Marathon and Half, Race 13.1 has a Summer and Fall Half, Bull City Race Fest, The Tarheel Ten Miler, Rock n Roll Raleigh, among so many others. This past Saturday however, me and the kids laced up for the ultimate in “local” races. 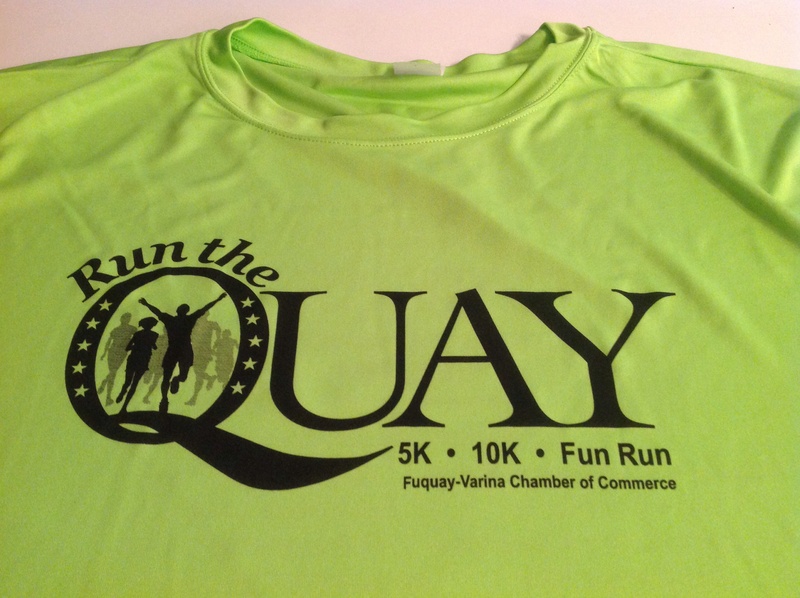 The 11th Annual Run the Quay 5k, 10k and 15 Quay Challenge. It’s about as close to my house as any race could be without living on the race course itself. A short three mile drive (if that) from the house, this twisty, turny and hilly race is almost in our back yard. One of my sons and I are both in the promo picture above from the race last year. I am wearing the purple shirt, and he is to the left of me in the red shirt. This year it was a family affair again. We made the quick trip and picked up our shirts and bibs on Friday evening before heading home for pizza. We relaxed that evening watching TV. My older son worked both of his jobs that day, so he didn’t arrive back home until about 10:30 pm. 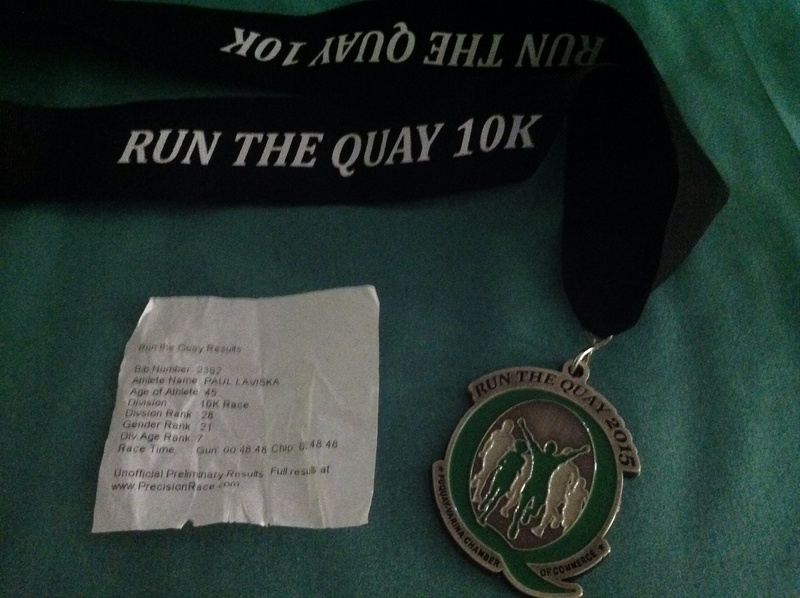 Last year I ran the 15 Quay Challenge (10k and 5k), and my younger son ran his first 10k. 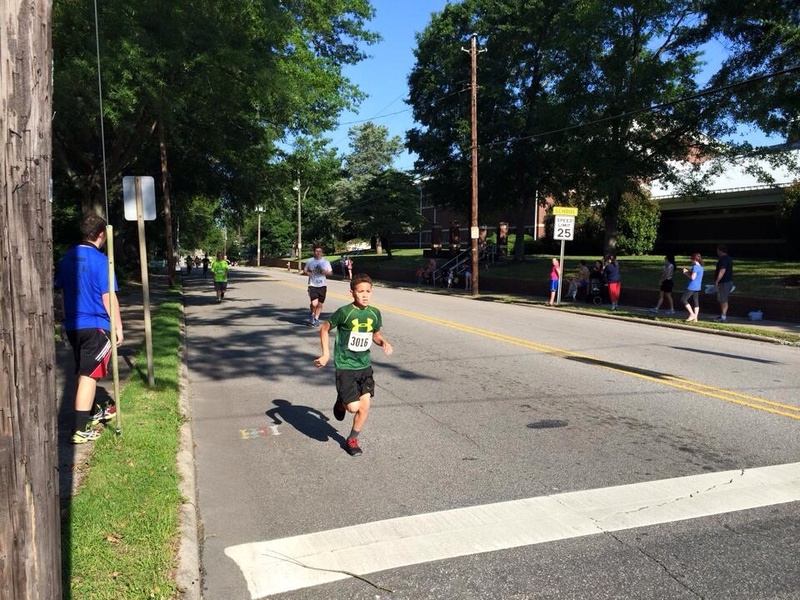 This year I ran the 10k along with my older son, and my younger son ran the 5k. You really can pick whatever distance you feel up to, and if you sign up early, like I did, it is a very cheap race to run. I think I paid $28 for the 10k, and early sign up for the 5k was only $20. I really had not been looking forward to the race that much because the early forecast called for hot and humid conditions. The past three weeks I have been training for pace, so I wanted a cool morning so that I could give last years finish time a run for the money. With a mega challenging course, this 10k can give you fits. I wanted to do well and beat my time from last year. The photo above shows the course from last year. This year the course was rerouted a bit, throwing in even more hills. I couldn’t find a course map to post here, but believe me, it had just as many turns and ups and downs as last year if not more. 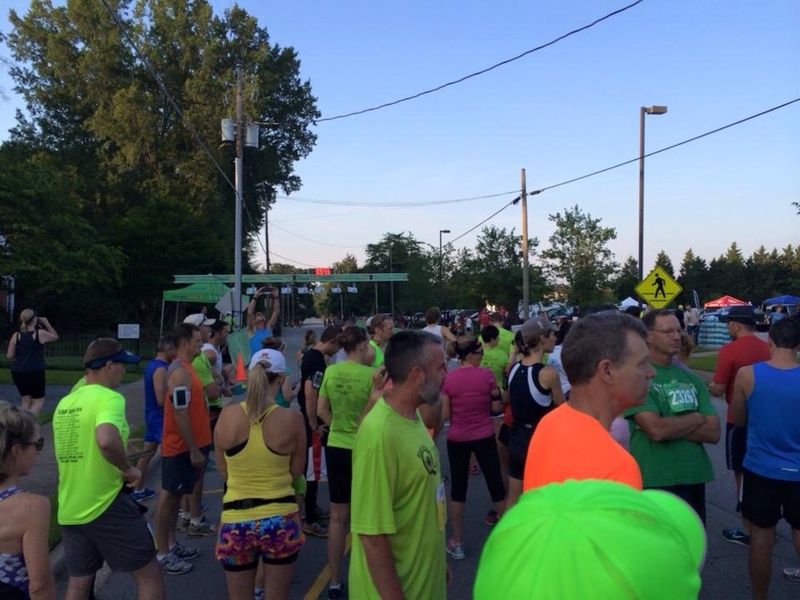 The 10k started at 7am, and being so close to the house we didn’t even leave home until 6:25. We lined up at 6:50 and were off right on time. My son was instantly behind me within 20 seconds, and I would never see him again until the finish. 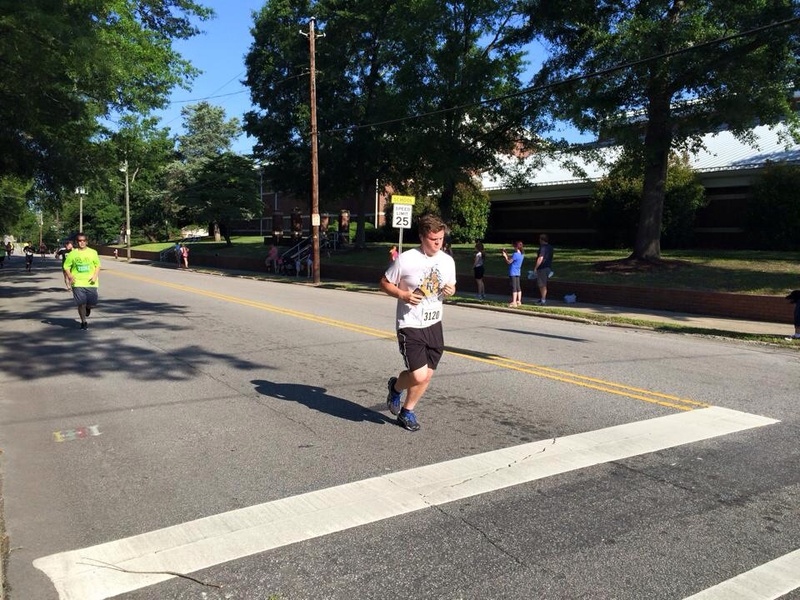 I clocked an impressive for me 6:58 first mile. This meant gunning for my 48:25 finish time from last year was doable. Body felt good, but the hills were relentless. I know, I know, I should be used to it, but it’s easier said than done. It was challenging. Mile 2 was 7:19, followed by an 8 minute mile 3. I was doing well, but not super like I wanted. I kept at it though, and pounded the pavement happily. It’s fun to race my towns event. Mile 4 came and went at 8:04, a bit of a rebound on mile 5 with a 7:53. 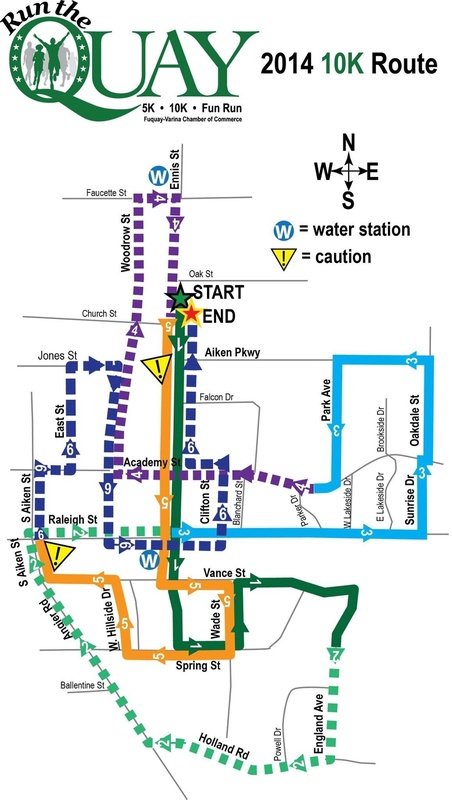 Because of the numerous turns and crossovers along this route, I managed to see my younger son walking from the car to the start for his race four times. It was cool! Nearing the finish, I knew that I was close to my goal. It wasn’t meant to be though, as the final 3/4 mile is all uphill and just sucked the last bits of energy out of me. 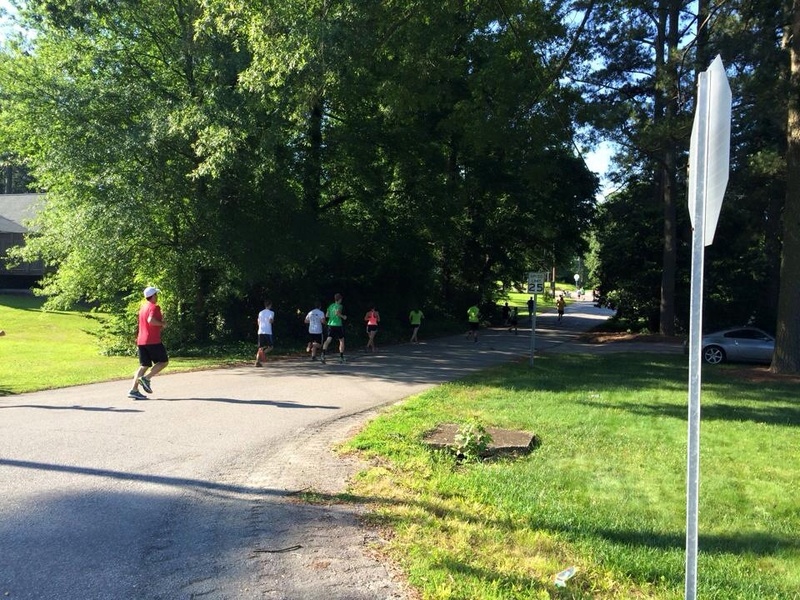 Mile 6 was 8:05. Pretty consistent all along the way, my final time was 48:48. Missing last years time by 23 seconds. After receiving my medal, I grabbed a water and waited for my older son to finish. Younger son by my side, we watched him come into view. I ran with him about 10 seconds up the hill nearing the finish to try to give him a boost. He didn’t need me, as I faded quickly in his dust up the final .2. Now we were done, and it was time for my youngest to get ready for the 5k which started at 8:30. My official result was 28/211 overall and 7/28 in the 40-49 age group. Not bad! Colton took off right at 8:30, and knowing we could see him at least three times on the course we rushed down the road to see him at mile 1.3, back up to the next block to see him at mile 2.2 and then further up to see him at mile 3 and cheer him on to the finish. Here are a couple of shots I took of him on his run. He finished in the top 10%, and was pretty pleased. 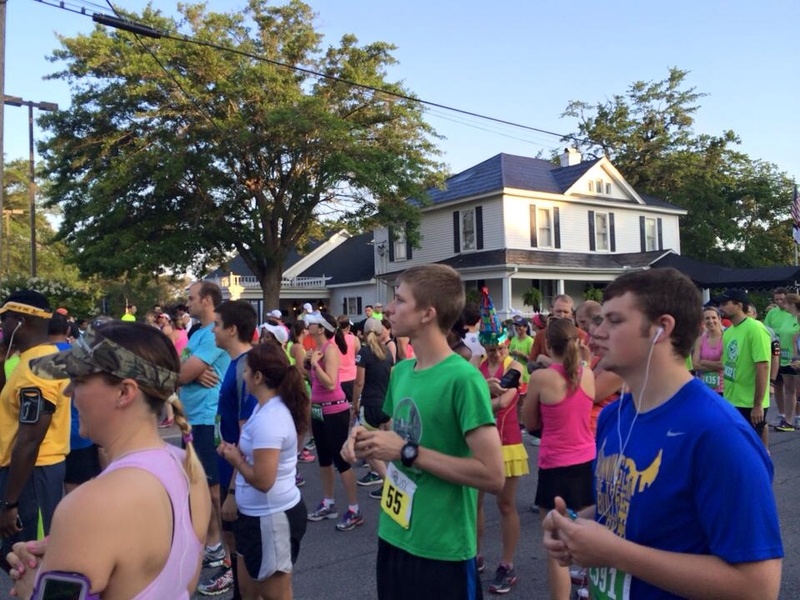 The 5k had over 650 finishers, which is pretty impressive for a small town race! This is such a fun event, and continues to grow year after year. I love running with my boys, it truly makes this event special to have them running along with me. Early on in my racing career I only ran short distance races. I became a real sucker for the feeling of going all out, and competing. As I grew in the sport of running I began a quest for more distance. Those numerous 5k races were becoming a bit boring, so I searched out the next level. 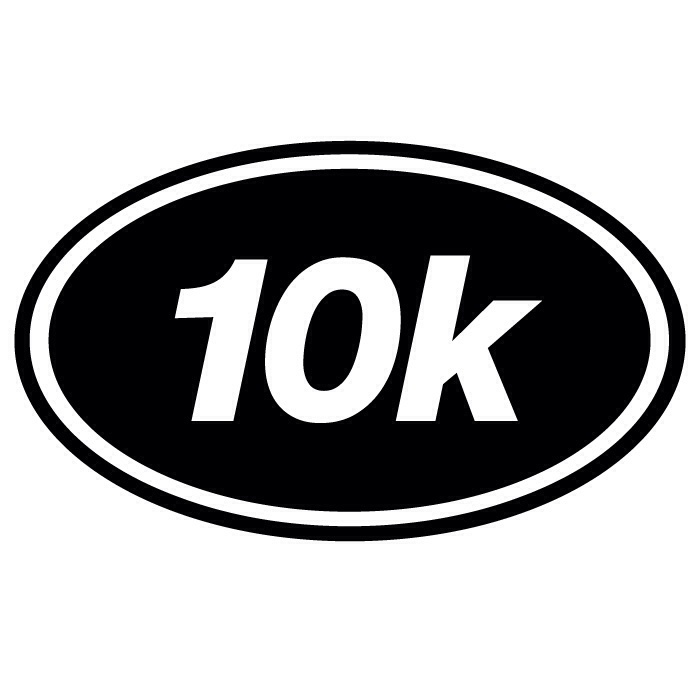 The elusive 10k. I’m not sure about you, but the 10k distance is hard to come by. A 10k race around here is few and far between. Funny thing is, that back a few years ago when I was learning to run further, I would seek out 10k races. If you can believe it, I even would travel to 10k’s. Twice making a mini weekend at the beach (a two and a half hour drive away) to run a 10k race. Another time I drove 4.5 hours down into South Carolina to run one. Crazy! I wouldn’t do that now. Those 10k’s are still hard to find though. My next race is local, and one of the few 10k’s in the area. I haven’t run a race shorter than a Half Marathon in almost a year. In fact, the 10k I have coming up is that same race. With that being said, my training focus over the next few week turns to speed versus distance. I’m so used to running 26.2 miles, that subtracting twenty miles out of that distance seems kinda cool. Yes, 6.2 miles will be considerably easier than running a marathon, but I haven’t been running sub 8 minute miles in quite some time. Focusing on speed is sort of foreign to me right now. My last 10k in June of 2014 was run at a pace of 7:47 per mile. A finish time of 48:25. Pretty good, but far from my best. See, I was also running a 5k race about 45 minutes after that 10k, so I wasn’t going full throttle. This time I can. My PR at the 10k distance goes way back to October of 2011. 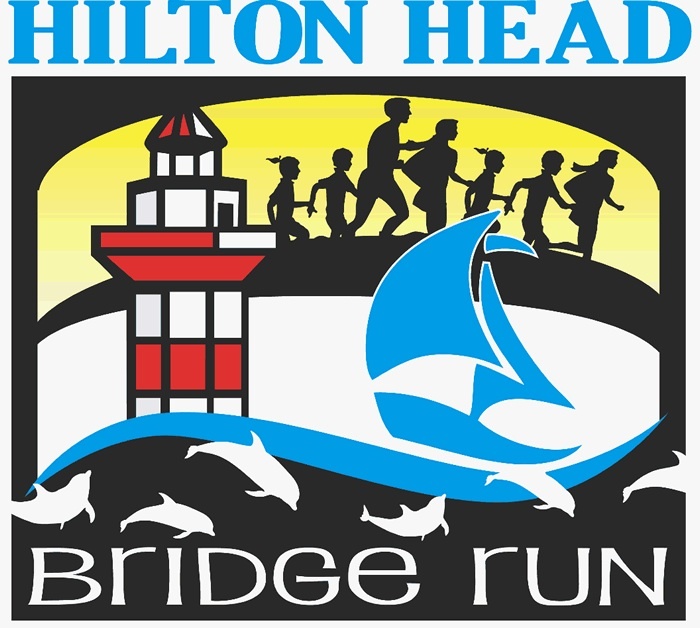 I ran a 43:09 at the Hilton Head Island Bridge Run. A speedy 6:56 pace! Man, how did I do that? Would love that result again in a few weeks, but I will settle for anything that beats my time from last year. My plan of attack… Run three, four and five mile training runs focusing on speed. It has been fun. I have a few more weeks of training runs, so I should be ready. My last 3.1 mile training run was a 7:58 pace, so I know come race day that I can pull in a better result. How do you feel about the 10k distance? Do you run them frequently? Are they a hard to find race distance where you live? Is it easy for you to switch gears, and race different distances? I’m finding it tougher and tougher to find my old speed because I usually race longer distances now. Any training tips you think might help me find that fast and furious speed?